I admit to being a little alarmed when I saw “Monkey — $8” on the appetizer menu. There’s still enough trepidation in these parts about sushi in general without adding exotic meats to the concept. Luckily, monkey meat isn’t actually on the menu. The Monkey appetizer contains no meat from our simian relatives — it’s deep-fried mushroom inside spicy tuna. Why it is called Monkey, I couldn’t tell you. I also don’t know how the Las Vegas roll ($11) got its name. But I do know it is one tasty creation. We’ve found it’s best to just give in to Ginger. Both the creative naming, the paucity of parking and the sometimes lengthy wait times. What you get, for your acquiescence, is delicious Asian fusion that can be customized to your whim. On a recent weekday evening, my companion and I were heartily urged by our server to try his favorite of the long list of Chef Signature rolls — the Vegas features shrimp tempura, asparagus and avocado inside the sticky rice roll, topped with spicy tuna and a special mayo sauce. It was a glitzy affair, from its sprinkle of effervescent orange roe to the protruding tail of the tempura shrimp at the end of the caterpillar-like presentation. The spiciness of the tuna was a nice counterpoint to the creamy avocado, earthy asparagus and sweet crunchy shrimp. If raw fish is not your thing, the Alaska roll ($9) is also filled with asparagus and avocado, as well as crab with a “K”, and it was quite delicious, topped with a sliver of salmon and baked so that it was warm throughout. A brief dip in wasabi and soy sauce, and a sliver of pickled ginger added a cool touch. I wish the crab were Dungeness instead of the K-crab, but nonetheless, the roll was delish. The Chef Signature roll menu begs to be explored further: A friend swears the lobster roll ($14) with baked baby lobster on top of a California roll is incredible. And we enviously watched plate after plate of colorful, intriguing preparations arrive in the full-to-capacity small dining room during our meal. For purists, there are also the regular sushi and sashimi options with a variety of fish — freshwater eel to sea urchin, several varieties of tuna, octopus and sea bass ranging from $4 to $6 for two pieces, $9 to $14 for seven. 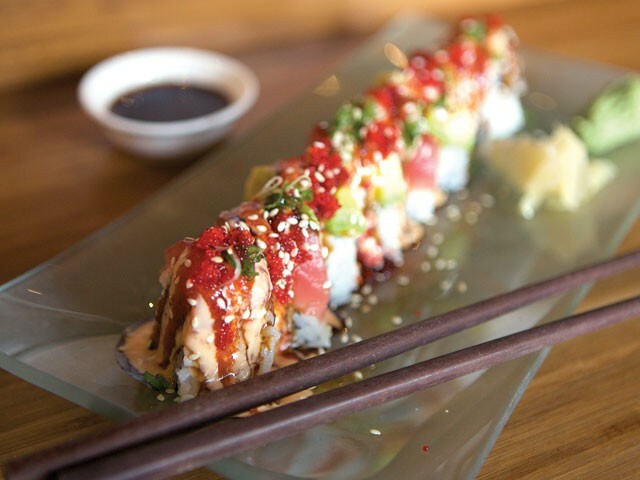 If you just can’t decide, let the chef do it for you with one of the sushi dinner combos from $12 to $70. Our server reported that the restaurant receives fresh fish deliveries at least every other day, from all over the world. In our efforts to sample dishes from various sectors of the vast menu, we tried the Crispy Walnut prawns appetizer ($10). These were some big tempura prawns, served tender and piping hot. They were enveloped in a honey-peach sauce that my companion loved deeply — I found it a bit too sweet and rich for an appetizer. Nonetheless it was hard to stop eating them. The serving is ample — enough for four people who would like to leave room for a meal afterward. The menu at Ginger is described as Asian fusion, and in addition to the hard-working sushi chefs at the sushi bar, the restaurant’s Beijing-born owners are equally busy back in the kitchen, according to our server. Every sauce, with the exception of the sweet and sour, is made on-premises, with each dish cooked to order. On previous visits I have become a fan of the Moo Goo Gai Pan, with tender chicken and a delicate ginger-wine sauce. The vegetable combos in dishes aren’t always consistent with what is printed on the menu though, so if you have a preference, or even if you want to add veggies to the meat-heavy entrée options, just ask. The Black Pepper Garlic Beef ($15) has one frequent diner in a veritable swoon, but I wasn’t in the mood for a garlic-fest, so our server recommended the Wok-Fried Mongolian Beef Tenderloin ($12). But I wanted veggies. So he suggested we turn it into a broccoli beef. No sweat, no fuss. And it was delicious. The meat was meltingly tender — not the stringy, overcooked stuff I’ve come to dread in broccoli beef. I could have used even more of the crunchy, fresh broccoli, but overall the dish was a success. Ginger is also popular with the lunch crowd — many choose the lunch-special bento box ($10-$11) that includes soup, steamed rice and veggies, as well as teriyaki chicken or beef, lemon chicken or grilled salmon collar with a California or Tiger’s Eye roll. Presented in a pretty lacquered tray, it will keep you full for the remainder of the day. Sat., April 27, 6:30-9:30 p.m.